Wonder what Churchill would say about Western Civilization now? And how instructive that Eleanor Roosevelt and the progressives thought he had gone mad. Just like progressives/liberals today who say Islamic civilization is not on a collision course with the West. Churchill and Roosevelt were tacitly instrumental in the creation of the Iron Curtain. They were like Pilate who could have done something but did nothing in allowing a great travesty and injustice to take place. 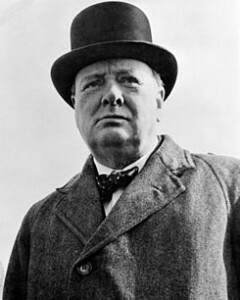 To his credit, Churchill realized that the West was victorious because all of central Europe was sacrificed. FDR never came to that realization and died as spiritually handicapped as he was physically.